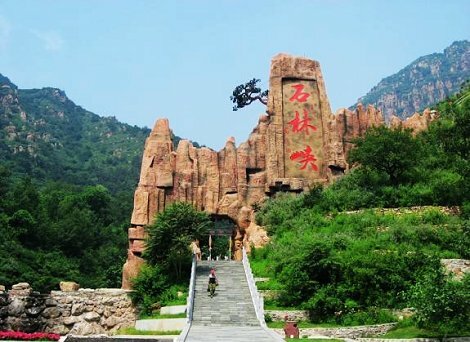 The Shilinxia Scenic Area (shí lín xiá 石林峡)(the Gorge of Stone Forest), 20 kilometers northeast of Pinggu (píng gǔ 平谷) and with an area of 12 square kilometers, is the core attraction of Huangsongyu Geopark (huáng sōng yù dì zhì gōng yuán 黄松峪地质公园). 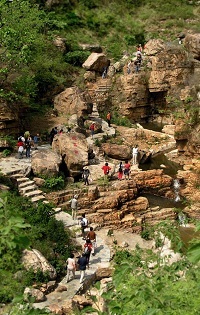 It is characterized by five unique views, namely, rocks, gorges, water, mountain and forest. Both the grandeur typically found in the scenery of north China and the grace of the scenery in the south can find their best expressions here. 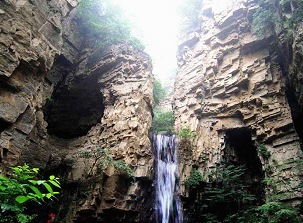 The Shilinxia Scenic Area covers an area of 12 square kilometers. It is named after straight and steep mountains that resemble a stone forest. What adds a romantic and mysterious atmosphere to Shilinxia is that the love story between Xiagu (xiá gū 霞姑) and Sanlang (sān láng 三郎), which is still very popular can be heard there today. In the area, the magnificent stone forest is divided into two parts, east and west, offering breathtaking views to everyone who visits. Seen from a distance, the stone forest offers spectacular scenery, while on a closer look, they present amazing shapes. 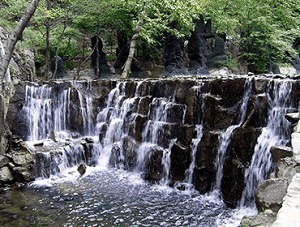 Besides the stone forest, the most notable one is a mighty four-tier waterfall, Jiutian Flying Waterfall (jǐu tiān fēi pù 九天飞瀑), which cascades down more than 120 meters and whose rumblings can be heard even in the distance. The gorge is dotted with over a dozen pools, running all year long. Some of them are shallow and crystal clear, others are deep and quiet. As a whole, they look like a shining pearl necklace draped across this beautiful landscape, adding much grace to the scenic area. The gorge itself is also a fantastic sight. The six kilometer-long gorge is very narrow, only three meters wide at the narrowest point. If the day opens a glimmer of, go in it next, make the public surprised. Walking through the dimly-lit gorge against the chill wind almost gives you a feeling of adventure. 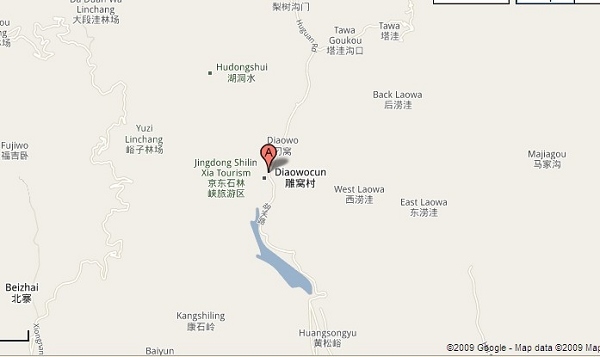 Rocks in Shilinxia are like books in a pile, with historical stories recorded on every page. Visitors love their rich implications. Since the primitive times, Chinese people have shown their affections for rocks. 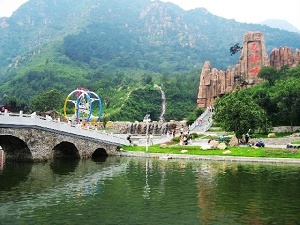 Gigantic rocks, some weighing over 1000 tons, are another attraction of the scenic area. They stand on tall cliffs and slopes or lie on the road in diversified shapes. Sitting on them, tourists can have a good rest and enjoy a beautiful sight. The fifth, but by no means the least, attraction are the hanging cypress trees. A great number of cypresses and other trees grow out of tall and steep cliffs, dotting the landscape. 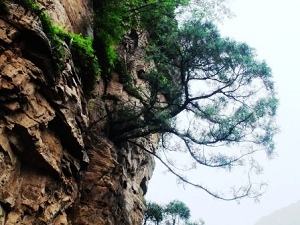 The tree trunk is on the wall of the precipice inclined and the root is grasped to attach in the wall of the precipice, which show remarkable resilience in spite of harsh environment. They may evoke images of classic Chinese paintings. The hollow mulberry is named after a famous heroine who lived hundreds of years ago, called Mushuaishu (mù shuài shù 穆帅树), during the Song Dynasty (sòng 宋). 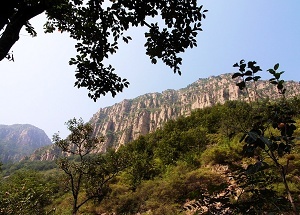 According to the elders, there is a Chaoyang Cave (cháo yáng dòng 朝阳洞) in the western hillside of Huangsongyu not far away from here. A Taoist priest named Yan Rong (yán róng 颜荣) was once practicing there. He helped the Liao Army (liáo jūn 辽军), who wanted to invade the Song Kingdom, develop a battle array comprising 108 formations. To defend her motherland, Lady Mu Guiying (mù guì yīng 穆桂英) led the Song Army to fight bravely with the Liao Army. They broke through all the 108 formations and eventually crushed the Liao invaders. On her way back to the capital, Lady Mu took a rest here and tied her horse to this tree, which, after so many years, still knows the secrets of what happened during this war. With lush vegetation, clean air and a pleasant climate, Shilinxia is an ideal destination for those searching for a great escape from bustling city life. Opening hours: 8:30 a.m. - 5:30 p.m. Address: Huangsongyu (huáng sōng yù 黄松峪), Pinggu District (píng gǔ qū 平谷区). Transportation routes: Take 918 from Dongzhi Gate (dōng zhí mén 东直门) to the new bus station in Pinggu, transfer to take 8 to go directly. Setting campfires or barbecues is strictly prohibited inside the scenic area, due to the danger of forest fires. Smoking is only permitted in designated smoking areas. Please follow designated visitor routes and keep off undeveloped areas. Please do not block the road. Please don’t pick or eat any herbs or fruits as some plants may be poisonous.